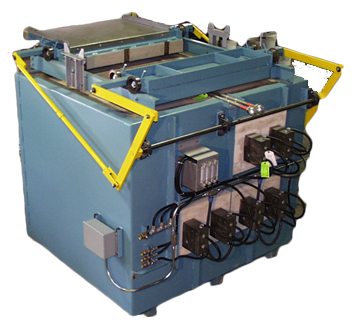 WELCOME TO AJAX ELECTRIC CO.
Of all the heat treating methods available salt baths can be the fastest, most efficient, versatile and economical to use. Spacing of Ajax heating elements used for internal heating results in the automatic circulation of salt which benefits uniformity of temperature and heat treatment. Circulation provides precise temperature control. Since heat is transferred by direct contact of the work with a heating medium of high heat capacity, Ajax salt baths heat your work many times faster than radiation or convection furnaces. Since work heats faster than in atmosphere or vacuum furnaces, smaller equipment is required for the same production level. With an Ajax salt bath your work is in contact at all points with the heating medium. Heating is even. As work is introduced salt freezes on the surface preheating the work evenly until the melt point of the salt is reached reducing thermal shock. Ajax maintains high standards in every department to provide our customers with the highest level of satisfaction. Control of all phases of the manufacturing process to provide a quality product. Ajax prides itself in maintaining long term customer relationships by providing technical support to our customer's staff for education of newer employees and supplemental knowledge for more experienced staff members.